I've been using this app for years on the iPhone and it's just as good on the iPad. I'm also happy with how quickly they released retina updates. There isn't quite as much content as Kenkyusha or some of the other major dictionaries, but the app itself is so much better that I'd still say this app is by far the best. And the content is also quite thorough with good definitions and lots of examples. This dictionary doesn't have enough words. "Eijiro on the WEB" much better, I can find any words that I want to know, and it's free (only problem is has to be online). This WISDOM has how to pronounce, a lot of examples...etc which are good parts of this dictionary. But so many words are missing. It might be a enough number of words for students, but definitely not enough for business. Please add more words!! This was the first app I had ever purchased when the app store went up, and still the app I use most. Occasionally it doesn't contain a rare Japanese word I'm looking for, and it would be nice if it could be used for Kanji stroke order reference, but otherwise it's perfect. Essential for any Japanese as a second language speaker. This is a great English-Japanese Japanese-English dictionary for anyone who is learning Kanji and comfortable reading in Hiragana/Katakana. While there is no furigana in the Japanese entries (as some have complained), the jump function (activated by holding down your finger over a world) will look up the word and give you the pronunciation and English translation. This is ideal for an intermediate/advanced student of Japanese because while readings and definitions are available, they are not presented in a way that disturbs you from reading Japanese in its natural form. This is also helpful to see how looked-up words get translated back. I do not understand reviews complaining this product requires knowledge of all kanji. That is certainly not the case. 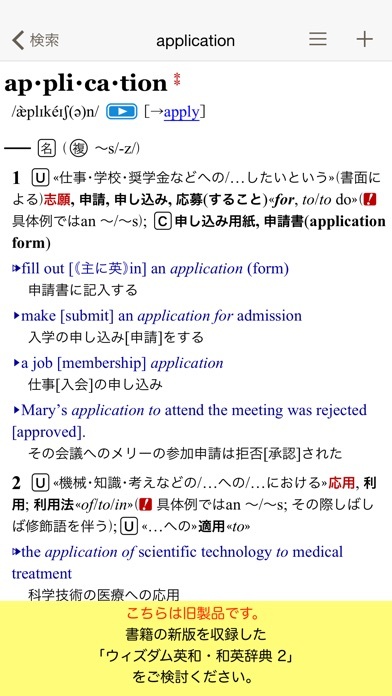 The dictionary has helpful example sentences in Japanese and English which greatly enhance it as a study tool. While it is not perhaps the most comprehensive dictionary available, it is by far the best dictionary I have seen available for the iPhone both in terms of content and ease of use. for JLPT2 and higher students of Japanese. Avoid unless you are intermediate or advanced. It is the dictionary I turn to when looking up new vocabulary. Having sample sentences in Japanese context is priceless. Worth every penny. Only wish is, it'd be great if there were a way to just browse entries! For those of you complaining about the lack of romaji, I highly recommend that you eradicate it from your studies ASAP. It will mess with your pronunciation and cripple your reading skills. IMHO even furigana will hurt your learning in the long run. V2.0 was released recently. The GUI is not as slick as before but there is a lot of added functionality: jump, sample sentence search, set phrases, bookmarks, history, etc. Overall, a nice upgrade in terms of functionality. A good J-E dictionary, just needs English localization. I bought this the first week it came out. I can't read kanji so going from E-J as an english speaker the app is useless. I emailed them about it and their response tone was "thanks but don't look for it soon." meaning it'll probably never have it, and I wasted $20ish bucks. Not to mention this was before apple allowed for refunds so I can't get one. Probably one of the dictionaries with a ton of content. True this is gear more towards native Japanese but if you are medium to advanced in your Japanese level it's really useful. Zoom needs to be worked on. Currently just using it in landscape is best to enlarge text. Hope they hyperlink the content like they do in their Encylopedia app.